Ibram X. Kendi, PhD, New York Times best-selling author and winner of multiple literary awards, is the keynote speaker at this year’s Fairfield University Martin Luther King, Jr. Convocation on Wednesday, January 30. 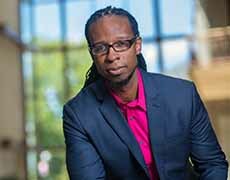 FAIRFIELD, Conn. (January 7, 2019)—Award-winning historian and New York Times best-selling author, Dr. Ibram X. Kendi will be Fairfield University’s keynote speaker at the 2019 Martin Luther King Jr. Convocation, on Wednesday, January 30 at 8 p.m. at the Quick Center for the Arts. The convocation is free and open to the public. The theme for Fairfield University’s annual Martin Luther King, Jr. observance is “Fighting for Racial Justice: Renewing the Legacy of Martin Luther King, Jr.” A week of programming celebrating the life and influence of the late Dr. Martin Luther King, Jr., will be held from Jan. 27-Friday, February 1. Dr. Kendi is a professor of history and international relations, and the founding director of the Antiracist Research and Policy Center at American University. He is also an ideas columnist for The Atlantic . His next book, How to be an Antiracist , will be published in 2019. A frequent speaker and contributor of newspaper editorials, Dr. Kendi has written for several publications including Diverse: Issues in Higher Education, The Root, Salon, The New York Times, New York Daily News, Time, Signature, The Huffington Post, The Washington Post, and The Chronicle of Higher Education . He has appeared as a commentator on local, national, and international radio and television outlets, including NPR, PBS, CNN, BBC, Al-Jazeera, NBC, Democracy Now!, and Sirius XM. His 2016 book, Stamped from the Beginning: The Definitive History of Racist Ideas in America , won the 2016 National Book Award for Nonfiction, making him the youngest author to win a National Book Award for Non-Fiction. The book was a finalist for a National Book Critics Circle Award, a Hurston/Wright Legacy Award, and a NAACP Image Award. It was selected by several outlets as one of the Best Books of 2016, including by the Boston Globe, The Root, The Washington Post, and Buzzfeed . Dr. Kendi has published 14 essays in books and academic journals, including The Journal of African American History, Journal of Social History, Journal of Black Studies, Journal of African American Studies, and The Sixties: A Journal of History, Politics and Culture . Reserve tickets for the Convocation by visiting quickcenter.com , or call the box office at 203-254-4010 or toll-free at 1-877-ARTS-396. Ophelie Rowe-Allen, Ed.D, associate dean and director of Residence Life and Student Diversity & Multicultural Affairs, and Rachelle Brunn-Bevel, PhD, associate professor of Sociology and Anthropology, are co-chairs of this year’s MLK Jr. observance, supported by a committee of volunteers. For more information about the week’s events, visit fairfield.edu/mlk . Fairfield University is a modern Jesuit Catholic university rooted in one of the world’s oldest intellectual and spiritual traditions. More than 5,000 undergraduate and graduate students from the U.S. and across the globe are pursuing degrees in the University’s five schools. Fairfield embraces a liberal humanistic approach to education, encouraging critical thinking, cultivating free and open inquiry, and fostering ethical and religious values. The University is located on a stunning 200-acre campus on the scenic Connecticut coast just an hour from New York City.